Good morning and thanks for coming back to our blog to check out Memory Monday. Today is a beautiful day here in Sandbridge and we are looking forward to a great week at the beach. We’ve had a lot of storms lately, but this morning is all peace and calm. How about you? Are you still looking forward to a peaceful week at the beach? Well come on down then! We still have select availability on properties between now and Labor day, and several on our specials page have fantastic promotional pricing available. So for our Memory Monday photo submission we have a couple of shots brought to us by Kenny Bills who stayed with us at Sandbridge Blue and provided us a picture of our summer. We have a picture of some impressive weather. 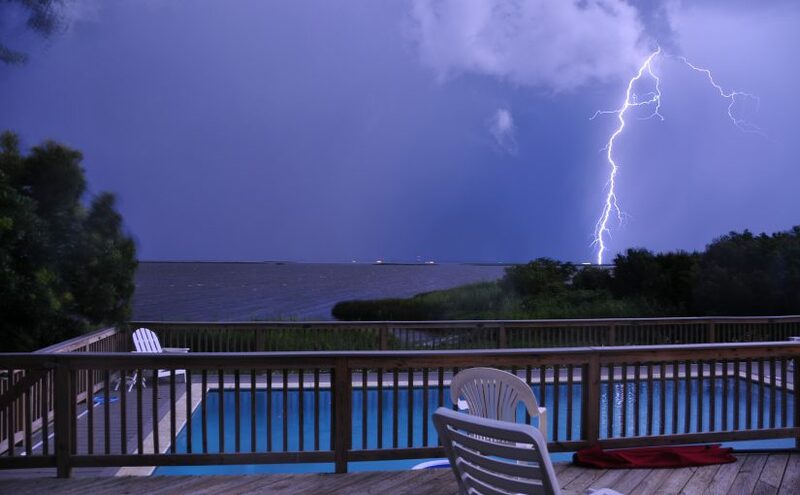 Here’s a well timed picture of a lighting strike over back bay from one of our houses. We’ve seen quite a lot of weather over the last few weeks, and while the forecast is for good weather this week, we have to admit there is something exciting about a summer time thunderstorm. It shows the power and beauty of nature all at one time. With power comes another thing we love about the beach and that is the peace and quiet of an early morning walk along the beach. In this picture some dolphins (you can tell the difference between porpoise and dolphins by the shape of the dorsal fin) are also enjoying the quiet with a stroll along the coast on their side of the beach. There is nothing like the view from the beach when a pod of these guys go strolling by the coast. Thank you Kenny for sharing your photo memories. Keep in mind we are always looking for great photos to share with our followers of your memories of staying with Sandbridge Blue. You never know – you may see your memories right here one day soon.